Métis and non-registered Indians, who went to non-Indigenous homes as part of the federal government’s Adopt Indian Metis program in the 1960s – the cross-Canada movement commonly referred to as the Sixties Scoop – will have to wait for legal action against the provinces and territories before they can possibly expect to receive financial compensation. Registered Indians and Inuit, who suffered the same fate as those other Indigenous children, however, could see between $25,000 to $50,000 from the federal government by mid to late 2019 if the November 2017 Sixties Scoop Settlement Agreement is finalized after court hearings in Saskatoon and Toronto this May. 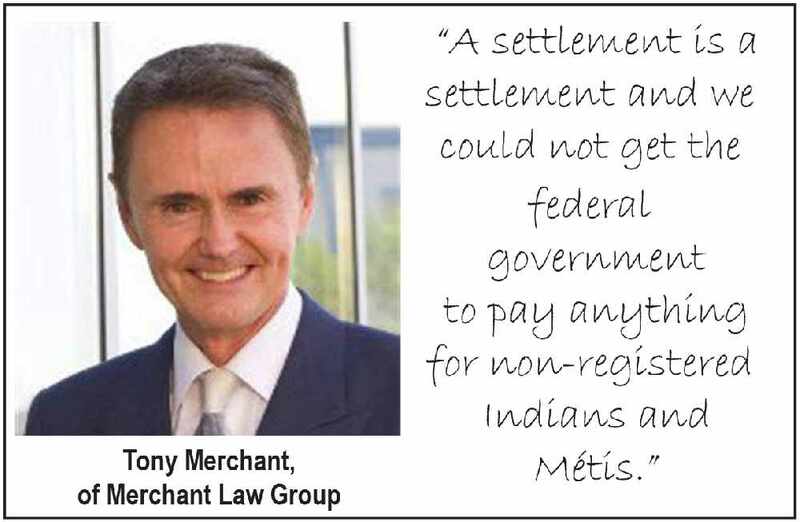 The exclusion of Métis and non-registered Indians in this settlement agreement does not sit well with Tony Merchant, whose firm Merchant Law Group led the charge for Sixties Scoop survivors to be compensated. “A settlement is a settlement and we could not get the federal government to pay anything for non-registered Indians and Métis,” said Merchant. But Merchant has no intention of letting the battle go for Métis and non-registered Indians, who were impacted by the federal government’s program, which was implemented by the provinces and territories. His law firm is presently registering names for a “second wave of litigation,” which will seek compensation from the provinces and territories for cultural loss for Métis and non-registered Indians, as well as compensation for registered Indians and Inuit, who suffered physical or sexual abuse in their foster or adopted homes. “It’s a tough case, incidentally. It’s not an easy case to win … because the responsibility of Indian and Northern Affairs (Canada), the responsibility under treaty, is clear, but the responsibility through social services and responsibility for Métis is a lot less clear,” said Merchant. He is uncertain as to how long it will take to resolve this issue in the courts, as it will proceed on a province-by-province basis. He is hopeful it won’t be more than two or three years. However, legal action against the provinces and territories will not move forward until the 2017 Sixties Scoop Settlement Agreement has been concluded, said Merchant. Money in that settlement may not be handed out until mid to late 2019 if the federal government has its way. Merchant says he is pushing for the money to be awarded as each application is received. However, how much money will be meted out individually depends on the number of First Nations and Inuit adults who apply under the settlement. The standard for compensation requires children to have been taken from their own homes and placed in non-Indigenous homes between 1951 and 1991, and who were alive on Feb. 20, 2009. For those who were alive on that date, but have passed away since that time may have a claim made on their behalf by their estate. As the government is unsure what those numbers will be – 20,000 or less will result in a $500 million settlement while 30,000 could make the settlement top out at $750 million – the money may not be paid out before mid to late 2019. Merchant says it is unclear as to how many Sixties Scoop survivors will apply for compensation. His firm has 4,288 registered names, representing about half the survivors involved in the claim. Also representing clients in the settlement are the law firms of Wilson-Christen, Koskie Minsky, and Klein. Under the agreement, the federal government will cover the legal fees of these law firms. Those legal costs are not part of the final settlement figure, says Merchant. Métis and non-registered Indians can receive benefits through the foundation. The proposed settlement is the consolidation of three separate class action suits – Riddle v. Her Majesty the Queen, White v. Attorney General Canada, and Charlie v. Her Majesty the Queen – into the Omnibus Federal Court Class Action. The same settlement conditions also apply for Brown v. Attorney General Canada, which is specific to Indian children in Ontario who were taken from their reserves between Dec. 1, 1965 and Dec. 31, 1984. To receive compensation, survivors have to apply to the government. Merchant anticipates they won’t be able to apply until October or November. The federal government will “render void” the agreement if 2,000 survivors opt out of the class action. They have until Sept. 30 to opt out. Merchant says it’s highly unlikely that number of survivors will opt out. But survivors can object to the settlement without opting out. Survivors have until April 30 to file objections. The judge will read the objections or the survivor may appear in front of the judge in person or through video conference at either location in May. “The judge doesn’t have the power to dictate a different deal. The judge can only say this is a bad deal and won’t agree with it,” said Merchant. Those who collect from the federal government under this agreement cannot undertake any further litigation against Canada for anything related to the Sixties Scoop. Read the agreement in principle here.